Donald Trump misleadingly touts tax cuts of 30 percent for “working people” or 35 percent for “a middle-class family with two children,” adding that Hillary Clinton “wants to raise your taxes up to the sky.” That distorts both Trump’s and Clinton’s plans. Some families could indeed see the cuts to their income tax bills that Trump cites, if they meet certain criteria. But change the criteria, and those tax savings change, too. It’s not a blanket reduction for “middle-class” families or “working people,” as the claims imply. 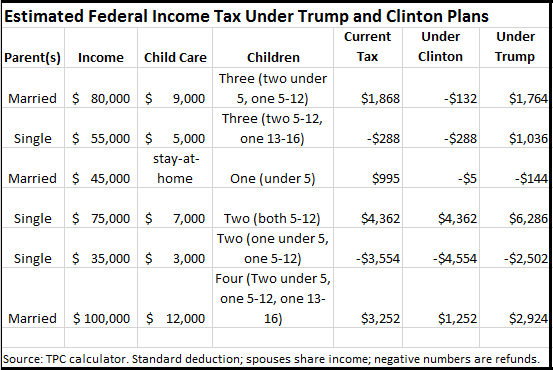 In fact, the family cited by Trump’s campaign would see either no tax increase under Clinton’s plan, a decrease or a larger decrease than under Trump’s plan, depending on the age of the kids. Trump’s plan eliminates the head of household filing status, which provides a larger deduction than the single deduction. That could increase taxes for some single parents. Large families also could pay more in taxes, because Trump’s plan, which raises the standard deduction, eliminates personal exemptions. That could increase taxes for some families with three or more children. Trump’s plan cuts off his average $5,000 child care tax deduction at age 13, so families with older children likely would not have their tax bills cut by 30 percent or 35 percent. Separately, a Trump TV ad also claims his plan includes an average “$5,000 tax reduction” for child care expenses. It’s a tax deduction — which lowers the amount of income subject to taxes — not a “reduction,” or what’s called a tax credit, off the taxes owed. To be sure, Trump’s tax plan proposes tax cuts at all income levels, on average, according to analyses by both the Tax Foundation and the Tax Policy Center. But an average tax cut doesn’t mean that every household gets one. We’ll go through several scenarios on what could happen to a household’s tax bill under Trump’s and Clinton’s plans, using tax calculators developed by both the Tax Foundation and the Tax Policy Center. When we asked the campaign about the claim, a spokesman pointed to a specific scenario the campaign has cited before: A married couple earning $75,000 per year with two children and $10,000 in child care expenses. Trump, in Sanford, Florida, Oct. 25: So essentially a middle-class family with two children will get about a 35 percent tax reduction. Isn’t that nice? It’s about time. The middle class in our country has been devastated. And by the way, crooked Hillary wants to raise your taxes up to the sky. She wants to raise. We are the highest taxed nation in the world. She wants to raise your taxes right up to the sky. True? It depends. It is true if that family fits the scenario the Trump camp cited — that is, a married couple earning $75,000 with two kids and $10,000 in child care expenses, which Trump would make tax deductible, and at least one child is younger than 13. In fact, such a family could see even larger percentage drops in their income tax bill, depending on the ages of the children and whether one spouse or both works. If we assume one spouse earns all of the $75,000 and both kids are older than 5 but younger than 13, we get a 43 percent federal income tax reduction using the Tax Policy Center’s tax calculator and a 45 percent reduction using the Tax Foundation’s calculator. For all of our examples here, we used the standard, not itemized, deductions for simplicity. Keep in mind they are estimates, as both tax organizations make clear. There are differences in how the two calculators work. TPC’s calculator is more comprehensive and includes more adjustable variables. For one, it includes the child and dependent care tax credit, which exists now and would remain under both candidates’ plans. It’s available to our couple earning $75,000, provided they both either work or attend school. And it applies for children under age 13. The Tax Foundation’s calculator is simpler and doesn’t include that dependent care tax credit, so we get the same result whether we divide the $75,000 income among the two spouses or not. If we divide the income between the couple using the TPC calculator, we get a tax reduction under Trump’s plan of 30 percent to 32 percent, again, depending on the children’s ages and provided at least one is under 13. The age 13 is also important for Trump’s plan, because his child care tax deduction cuts off at that age. As we mentioned, his TV ad claims this is a “tax reduction,” but it’s a deduction, not a tax credit. His plan allows parents to deduct child care expenses — up to the average cost in their state — from their income for up to four children up to age 13. His website says the deduction is limited to those earning under $250,000 a year or $500,000 for couples. And for low-income workers, making under $31,200 a year, he proposes increasing the earned income tax credit by an amount equal to up to half of the payroll taxes paid by the parent earning the lesser amount. If a family earning $75,000 has two kids 13 or older, and therefore not eligible for the child care deduction, the tax savings could be 14.4 percent according to the TPC calculator and 15 percent under the Tax Foundation’s. The Tax Foundation’s calculator only includes an adjustment for the number of children under age 5, a stipulation that matters for Clinton’s plan, which would double the child tax credit for children under that age. And what about the tax implications for the hypothetical family earning $75,000 under Clinton’s plan? We found, using both tax calculators, that the family’s tax bill would stay the same as it is under current law, or it could decrease if at least one of the children was under 5. In fact, if both of the kids were under 5, that family could save more than it would under Trump’s plan. Under Clinton’s plan, the married couple earning $75,000 with two kids under age 5 and $10,000 in child care expenses could see a reduction in their income taxes of 50 percent, if one spouse worked, and 73.2 percent if both spouses worked. Trump was wrong to tell his audience in Sanford, Florida, that a “middle-class” family with two kids would “get about a 35 percent tax reduction” under his plan while Clinton “wants to raise your taxes up to the sky.” The hypothetical family his campaign cites wouldn’t see a tax increase under Clinton and could even get a larger tax cut if their children were young. As we have written before, the analyses from the Tax Foundation and Tax Policy Center both found that nearly all of the tax increases Clinton has proposed would fall on the top 10 percent of taxpayers. “Nearly all of the tax increases would fall on the highest-income 1 percent; on average, low- and middle-income households would see small increases in after-tax income,” the TPC concluded. Adjusting the Trump campaign example even just a little yields different results. For instance, a married couple with $70,000 in income, two kids (one under age 5) and $7,000 in child care expenses could save 21 percent, or $418, off its federal tax bill under Trump’s plan. It could save 50 percent, or $1,000, under Clinton’s. We used the Tax Policy Center calculator for those numbers, since it’s more comprehensive. But we found the same directional changes — families paying more or less or the same — in the Tax Foundation calculator. Trump also proposed allowing tax-free contributions, up to $2,000 per year, to dependent care savings accounts, with a 50 percent federal government match for low-income parents who contribute up to $1,000. So families who took advantage of that program could lower their taxable income. As we stated, we used the standard deduction, but we’ll give one example using itemized deductions. The Tax Policy Center provides examples of taxpayers deducting their mortgage interest, charitable contributions and the like. A married couple earning $82,300 with $4,300 in child care expenses (one child under 5, one 13-16) and itemized deductions could save 13.9 percent (or $571) off their total tax bill under Trump’s plan. The family saves $1,000 under Clinton’s. Under Trump’s plan, while on average, every income tax level sees a tax cut, it doesn’t work out that way for everyone. As the examples above show, single parents tend to do worse under Trump’s plan than under current law. That’s because he eliminates the head of household filing status, which provides a larger deduction than the single deduction. And families with children under 5 tend to gain under Clinton’s plan because of her doubling of the child tax credit for those children. Lily Batchelder, a visiting fellow at the Tax Policy Center and a professor at the New York University School of Law, has calculated that Trump’s plan would increase the tax burden for about 8.7 million families. “About 20 percent of households and more than half of single parents would pay more in taxes,” she writes in an Oct. 28 paper. Trump’s plan raises the standard deduction and eliminates personal exemptions, which works out fine for families with two kids. They’d get $28,800 in standard deductions and personal exemptions under current law, and get $30,000 under the Trump plan. But for a family with three kids, it’s a worse deal — the normal $32,850 deduction and exemptions for them would be reduced under the Trump plan to the flat $30,000. With four kids or five, the gap between current law and the Trump plan widens. Also, the 10 percent tax bracket, which applies to the first $18,550 earned by a married couple under current law, would be eliminated and replaced with a 12 percent bracket. Whether this hurts a couple’s tax bill depends on their total earnings, and other factors. The Tax Foundation told us it was able to replicate Batchelder’s results. But again, on average, it found middle-income taxpayers would see a tax reduction. “Simply put, the middle class as a whole would see a tax reduction, but some middle class families would see a tax increase,” Alan Cole, an economist with the Tax Foundation, told us. Some would get a bigger reduction and some would get less, or even pay more in taxes, as we’ve shown. But they’re clearly not all getting a 30 percent or 35 percent tax reduction, as Trump’s claims imply. Trump tries to measure the impact of his tax plan as the change in federal taxes owed. But both the TPC and Tax Foundation use the change in after-tax income as their preferred measures in analyzing tax plans. The TPC explains that after-tax income shows the change in income available to buy household necessities relative to what a household had before the tax change. Williams notes that Trump’s advisers say he would instruct Congress to make sure taxes on low- and middle-income taxpayers weren’t raised. “Congress would have to modify Trump’s plan significantly to obey that order,” Williams says. Perhaps the only way to do it is to offer both the current tax code and the new one under Trump, from which taxpayers would choose. Of course, both candidates’ tax plans would face an uphill battle in Congress.